Bikeability is a cycling training scheme designed to give children skills and confidence to ride their bikes. It takes children and young people through three different levels, awarding development at each stage of the training process: level one teaches basic skills and bicycle handling; level two gives children the skills they need to cycle safely to school on quiet roads; level three covers more complicated traffic environments. Bikeability caters for children with special needs. Cycle-re-cycle.org.uk is a voluntary organisation who recycle old and unwanted bicycles, parts, accessories and cycling clothing. Cycling Projects is a national charity with a vision to ensure that cycling is accessible to all. They run a project called Wheels for All, with 40 locations around the UK, giving disabled people the chance to cycle. Wheels for All centres are run by groups often led by care workers, physiotherapists or enthusiastic parents and family members. The groups offer regular cycling activities all year round and are able to work with children on a one-to-one basis. Get Cycling offers a special needs try-out roadshow which can be customised to client's requirements. 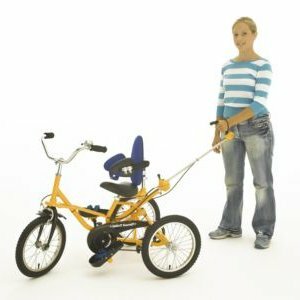 They have approximately 40 specialised cycles which they bring and demonstrate including handcycles, wheelchair tandems, steer-from-the-rear tandems, tricycles, low step-over bikes and side-by-sides. The Handcycling Association of The UK (HandcyclingUK) promotes handcycling as a sport and as a recreational activity. You can be as competitive as you like or just ride socially with your family and friends. Sustrans is a sustainable travel charity which is involved in setting up the national cycle network. There are a wide range of free cycling maps available on their website and long distance routes are availble to purchase from their online shop. The Tandem Club is a members organisation (annual subscription fee is £ 10) with over 40 regional officers around the UK who can be contacted to find out what is happening in your area or for advice on how to arrange activities. You do not have to own a tandem cycle to become a member. The Tandem Club has a Disabilities Liaison Officer who may be able to help with queries related to disabled people and to visually impaired cyclists.